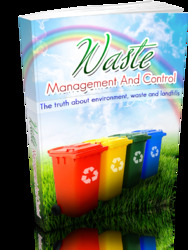 Increasingly stringent requirements for the removal of organic and inorganic substances from wastewater have necessitated the development of innovative, cost-effective wastewater treatment alternatives in recent years. The aerobic rotating biological contactor (RBC) is one of the biological processes for the treatment of organic wastewater. It is another type of attached growth process that combines advantages of biological fixed-film (short hydraulic retention time, high biomass concentration, low energy cost, easy operation, and insensitivity to toxic substance shock loads), and partial stir. Therefore the aerobic RBC reactor is widely employed to treat both domestic and industrial wastewater [16-18]. A schematic diagram of the rotating biological contactor (RBC) unit is shown in Fig. 13; it consists of closely spaced discs mounted on a common horizontal shaft, partially submerged in a semicircular tank receiving wastewater. 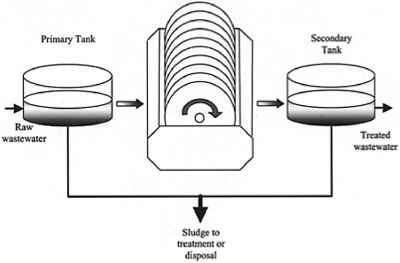 When water containing organic waste and nutrients flows though the reactor, microorganisms consume the substrata and grow attached to the discs' surfaces to about 1-4 mm in thickness; excess is torn off the discs by shearing forces and is separated from the liquid in the secondary settling tank. 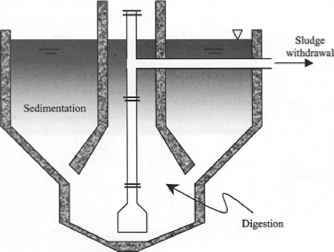 A small portion of the biomass remains suspended in the liquid within the basin and is also responsible in minor part for the organic load removal. 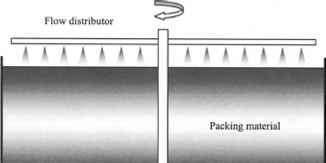 Aeration of the culture is accomplished by two mechanisms. First, when a point on the discs rises above the liquid surface, a thin film of liquid remains attached to it and oxygen is transferred to the film as it passes through air; some amount of air is entrained by the bulk of liquid due to turbulence caused by rotation of discs. Rotation speeds of more than 3 rpm are seldom used because this increases electric power consumption while not sufficiently increasing oxygen transfer. The ratio of surface area of discs to liquid volume is typically 5 L/m2. For high-strength wastewaters, more than one unit in series (staging) is used. Figure 12 Sketch of a trickling filter unit. Figure 13 Diagram of a rotating biological contactor (RBC) unit.